Greensleeves by Eloise Jarvis McGraw ~ 1968. This edition: Harcourt, Brace & World, 1968. Hardcover. 311 pages. This vintage “young adult” novel is a gorgeous bildungsroman concerning the daughter of celebrities who is given a chance to temporarily reinvent herself as a nobody. 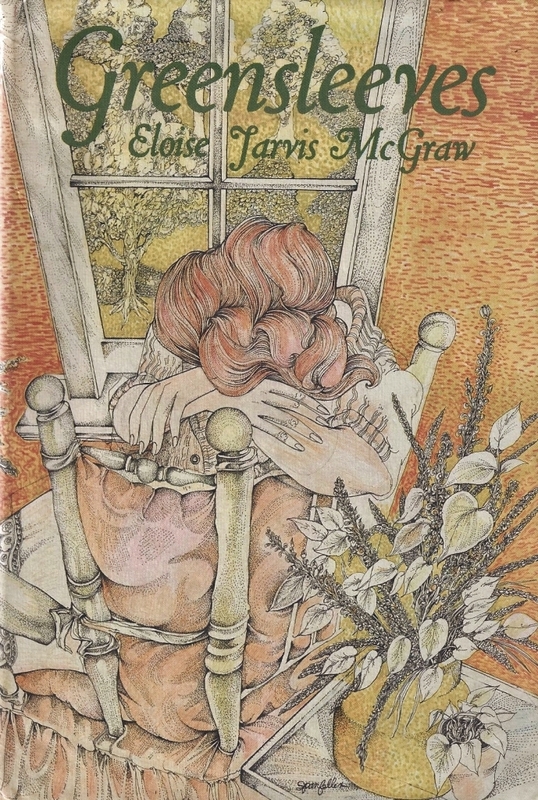 As a (once-upon-a-time) homeschooling parent I was already familiar with Eloise Jarvis McGraw from her often-recommended books for slightly younger readers such as The Golden Goblet and The Moorchild, and I generally liked her work. But I’d never heard of her 1968 novel Greensleeves until bumping into my cyberfriend Jenny’s post, wherein she calls Greensleeves one of her favourite books ever, and goes on to review it in glowing terms. I was immediately interested, as we share similar tastes in a number of genres, and set off on a quest for a long-out-of-print copy for myself. Rare indeed, this one was, with prices as expected, but I took a deep breath and went for it, and by golly, Jenny was right. This is a charmer. So if you’ve been and done what I said to do and have read Jenny’s post and then come back here to see what else I have to say, I’ll pad things out a bit. Our heroine Shannon/Georgetta/Greensleeves is an utter mass of insecurities on the inside, though she presents exceedingly well on the outside, a state of affairs I am sure a lot of us can relate to, right? Even well beyond those brutal teenage years, when we’re trying to figure out who the heck we are, and how to find friends, and the complications of romantic love and the freight train of sexual feelings and how to be true to yourself when you don’t even know what that really means because life is so utterly complicated. So all of that aside, the story is absolutely entertaining, as Shannon reinvents herself and puts her new persona across with mixed results to a crowd of new acquaintances. She goes into her new world thinking one thing, finds herself rather mistaken, does a mental flip, and then despite her personal epiphany finds out that people are just going to do what they’re going to do regardless of well-intentioned meddling from outside forces. The only cage door you can open is your own, because the trickiest latch is on the inside, and sometimes the cage is where you need to be. And sometimes not. Okay, that’s the message, which I seem to be stuck on this morning, despite my intentions of telling more about the actual story. This is my third time reading this book, and it’s still pure pleasure. It belongs on the same shelf as I Capture the Castle, another of my cherished vintage “teen” reads which defies its ghettoization as a “young adult” book, whatever that is supposed to mean. I mean, good is good, right? Whether “targetted” for a ten-year-old, sixteen-year-old or fifty-year-old. I don’t think we change all that much inside our heads, no matter what the externals do. Or so I am finding in my own case. Essentially I am the same person I was way-back-then, with of course layers of experience and what I like to think of as wisdom <insert smiley face here> tempering the highs and lows of my emotional range. Greensleeves is sweet but not mawkish, thoughtful but not preachy, frequently very funny, and also a little bit heart-rending in places. It’s utterly relatable in its essentials, in a vintage sort of way. It is an absolute period piece, and I say that with an approving nod, because it captures elements of its era wonderfully well. So, if this sort of thing appeals to you, you will be happy to hear that the novel has recently been republished (in 2015) and can now be found both new and used at exceeding reasonable prices. It’s part of the “Nancy Pearl’s Book Crush Rediscoveries” reprint series, with a foreword by the aforementioned Nancy Pearl, who I must confess I have zero familiarity with. Obviously I’m way out of that loop, but here is what Wikipedia says about Nancy Pearl, and on the strength of that, and of her championship of Greensleeves (among other neglected books) I say “Hurray” for her! Oh, yes. My rating. 9.5/10. I read this last year (thanks to Jenny and Nancy Pearl’s enthusiasm) and found it very enjoyable. For me, it wasn’t quite of a class with I Capture the Castle but definite comfort read gold. And I loved that the ending was too neatly tidied up. No, it’s definitely not up to I Capture the Castle quality – that one holds a special place in my romantic heart – but it’s in that same comfort read category, isn’t it? I like the ambiguity of the ending; I liked how the characters dealt with their key dilemma and let things proceed without being all about instant gratification. Oh gosh you’ve been busy. I check this blog once a week (it’s in the Thursday folder) and now I find such riches. I’ll have to settle down later with a cup of tea and go through the past week’s offering…. We’ll see if I can keep up the pace. 🙂 It is after all winter, dark in the evenings, and I am suddenly spending a lot of time alone, as the last nestling is engaged in fulltime work in town, prepatory to heading out into the wider world. (She’s building up the bank account for further education, in other words.) Which means I get to concentrate uninterrupted on both reading and writing, versus having to converse with all and sundry. I’ve also managed to at last free myself after many years from a time-consuming volunteer job involving lots and lots of keyboard time; the blog will likely benefit from that. Of course, spring and the busy greenhouse-and-garden time is visible on the horizon, so I may once again disappear as discretionary time for playing on Leaves and Pages gets used up elsewhere! Thank you and Jenny! Your review and rating sent me straight to ordering it… will let you know what I think after I have read it. I hope you will find it enjoyable. I think you will! Girl, you should have seen how excited my face was when I saw this post pop up in my google reader. I am so glad you read this and liked it. I adore and cherish it enough to own two copies, a decision I absolutely stand by. I also read this on Jenny’s recommendation! I wish I had come across it when I was younger. It was so rare to read a story set in the Pacific Northwest – where I was living at the time. I loved the Portland setting. I was born there, and after we moved away visits to family were always a high treat. Yes, the setting is something I appreciated as well. In particular the scene set overlooking the Columbia Gorge. Having had the good fortune to visit the area in recent years, this was such a treat to read about! t’s a very regional sort of novel, isn’t it? Full of references to real places, the weather, the flora… Nice. I completely missed this as a teen. I would have devoured it if I had come across it. But better late than never! I enjoyed this book also, I’ll have to reread soon. Thank you for the reminder! And I must say, I love the word “mawkish”. I looked it up and am delighted by it!